Like the diverse members of the congregation itself, the kiddush luncheon dishes that frequently follow Shabbat services at Singapore’s United Hebrew Congregation reflect the richness of Jewish life from around the world. But the menu is also a highly personal one, reflecting the extraordinary spiritual journey and culinary biography of Rosita Ezra Goldstein, the home cook who has made it her personal mission to build the Jewish community in Asia, through food. Rosita Goldstein grew up in Indonesia where the majority of the population is Muslim. Her parents took religion very seriously, and as part of the small Christian minority assumed the leadership roles, to help the community thrive. For Rosita’s mother, this meant cooking for everyone. There were frequent feasts after church services or following weeknight Bible study that took place in their home. Her mother would also make sure to cook halal meals for their Muslim friends and neighbors, so that everyone could come together. Watching and helping as a young girl and then a university student, living at home Rosita learned from her mother, not only how to cook, but also the value of cooking in maintaining connections and culture. As a young woman, Rosita Goldstein, who lived and graduated university in Jakarta, and then met Harvey Goldstein, shortly after receiving her computer science degree. Born in Brooklyn, Harvey Goldstein came to South-East Asia as part of a mission of PhDs from Cornell University’s not-for-profit research laboratory and stayed on to make a career in business. Before they even went out on a date, he sought permission from her parents, and the two have been happily married for over twenty-two years. The Goldsteins have 4 children; Brandon, Bradley, Tiffany and Stephanie; ranging in age from 12-22. They wanted their children to grow up proud to be Jewish and feel comfortable as multicultural Jews. Each of the children has been bar/bat mitzvah-ed at United Hebrew Congregation, Singapore. In feeding the United Hebrew Congregation, Rosita builds on her childhood tastes as well as those she has come to know from exploring Jewish life around the world. “There is always hummus,” Rosita explains, “people love hummus.” There are also Sephardic dishes, like stuffed grape leaves and Middle Eastern spicy chicken. For the holidays, she often draws on the classics of the Ashkenazi kitchen with highlight being like stuffed cabbage rolls, blintzes and rugelachs. She takes creative liberties with her challah sometimes making them plain but more-often filling them with chocolate, cinnamon, nuts and/or mixed-fruit. For Rosh Hashana, Rosita will be adding to the traditional Jewish repertoire to include an Indonesian festive dish that picks up on the ancient Jewish tradition of preparing symbolic foods for the New Year. From her native Indonesia she will be making Nasi Tumpeng is a yellow rice dish, shaped like a cone. Each component has as symbolic meaning. The rice, which starts off white as a sign of purity and sits in the center, will be colored yellow by cooking it with tumeric, which symbolizes prosperity, wealth and joy. 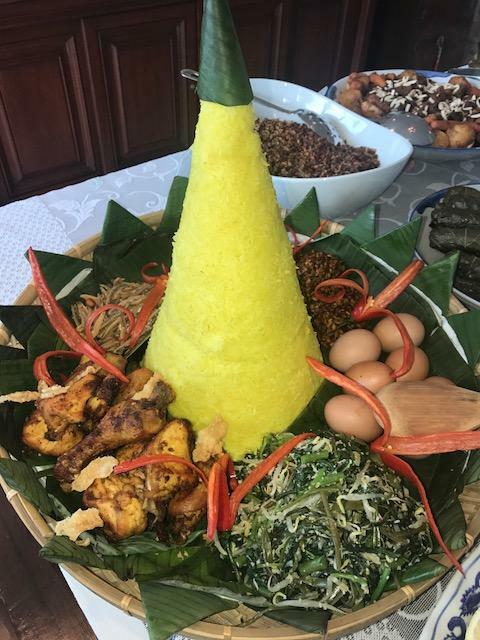 In Indonesia, Nasi Tumpeng is usually served during the celebration of births, birthdays, graduations,the seventh month of pregnancy, etc etc. Each of the additional elements of the dish has a meaning as well. Forsaking arrogance, much like the Jewish tradition of beating our enemies by eating beets at Rosh Hashana, is done through symbolically consumption of the evil inclination. In Javanese culture, roosters are considered arrogant and therefore are served to stamp out the arrogant inclination. Community is important so, dried anchovies, served with peanuts, are added as fish swim in schools as a reminder not to leave any member of the community behind. Unpeeled eggs are part of the dish because there is not a short-cut for peeling an egg. First you must crack the shell then remove each part. Therefore the unpeeled egg is a reminder that problems must be solved step by step. The inclusion of water spinach, with its wide shady leaves; encourages both cool and calm. Finally the red chiles are like lanterns, that bring light to all who are around us. After years of being asked to share her recipes, Rosita Goldstein decided to collect her favorites and publish a cookbook. 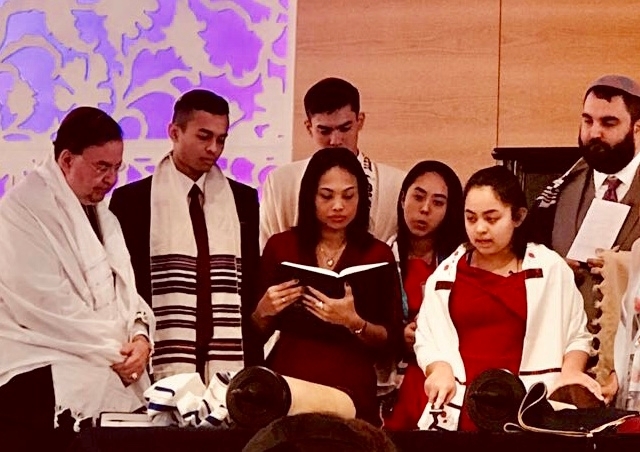 It can be ordered through the congregation with the proceeds going to support Singapore’s United Hebrew Congregation which will be hosting an Asian Jewish gathering on January 24-27, 2019. It is filled with stories, photos and recipes that like Goldstein’s life, is based on centuries of tradition with innovative twists as is her facebook page. Mix all the ingredients with the rice inside a rice cooker. Turn on the rice cooker to cook the mixture. While the rice is still warm, pack it tightly inside the cone*. As you pack the rice in, make sure to press it down to ensure no space inside the cone is wasted. Serve the rice by flipping the cone quickly onto its base on a serving dish, and carefully removing the paper cone to leave behind just the rice. Lay a sheet of baking paper to completely cover an A2-sized sheet of cardstock paper, and secure the two using scotch tape. Grind all spice paste ingredients. Heat oil and sauté the spice paste until fragrant. Then add the grated coconut, mix it well for few minutes. To Serve: Combine the steamed vegetables with the spiced grated coconut. 1 whole chicken, cut it into 8 pieces. 4 cm fresh turmeric or 2 tablespoon turmeric powder. 1.5 teaspoon toasted coriander seeds. 1 stick of lemon grass (flattened). shallot, coriander seed, salt, and pepper together. Marinate the chicken in the spice paste for a minimum of 2 hours, preferably overnight. Hard boiled eggs: Make according to your preferred method. Serve with shell on.